We offer a wide range of wood picture frame mouldings, from the simplest black frame to western & rustic barnwood styles to the elegant... and everything in between. Unlike some corporate frame shops we aren't restricted to certain suppliers. Our collection includes over 2000 samples that represent more than a dozen different manufacturers. This allows us to pick and choose designs that we feel will best serve your needs. All frames are custom cut and built "in house", this allows us to guarantee the highest quality of craftsmanship. We use Nielsen and Clark brands of aluminum frame mouldings. Between these two industry leaders we have a great selection of styles and colors. With a wide variety of both painted and anodized finishes. We have a wide selection of ready-made frames in many styles and all of the most popular sizes. Perfect for that quick framing project or the budget conscious shopper, get a custom look at pre-made prices. We also carry Raphael hand wrapped fabric covered liners. Liners are typically used in place of a mat when framing a painting on canvas. Most frame shops will carry a few linen covered liners in basic colors (white, cream, black & grey). Raphael offers a rainbow of colors and large selection of fabric choices including suede, ultra-suede and both fine and raw silk, along with the more traditional linens. These can be used to add color to your frame or to create that extra depth for three dimensional objects. Any of the fabric choices can be wrapped on a variety of profiles, from 1 inch wide to 4 inches. Along with all of our mouldings we carry a large selection of fillets (small accent mouldings), these can be used to add that little something extra to your frame. 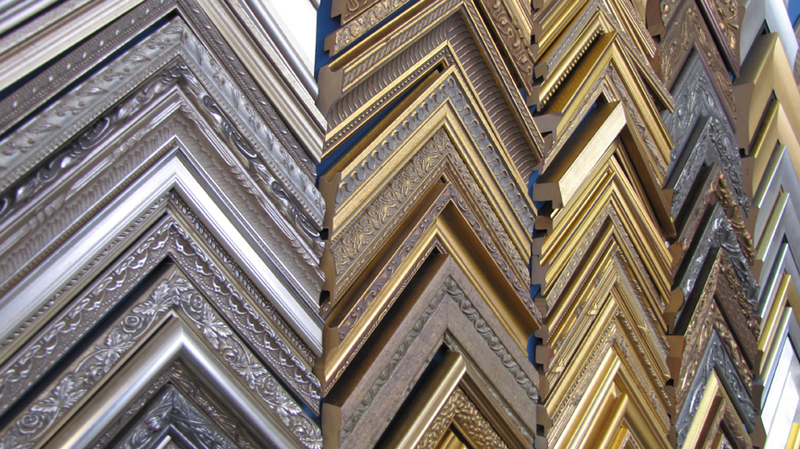 If you find the perfect frame, but you just wish it had a gold edge... we can do that! Fillets can also enhance the matting, if used around the inside of the mat window.